Round Mt Egmont and New Plymouth in the Taranaki region on New Years eve. We decided on the "Round the Mountain" route/itinerary today, so leaving Cape Egmont Lighthouse we turned left onto the Surf Highway 45 (a highway which runs from Hawera to New Plymouth). The Surf Highway 45 has some of the best surfing in New Zealand, and from the many black sand beaches that fringe the Taranaki coastline, you can see surfers bobbing out in the Tasman waters waiting for the right wave. We took a turn off from the Surf Highway to Lucy's Gully in the Egmont National Park. Here we found a small stand of Redwood trees surrounded by native tree ferns, and other native specimens. At the town of Oakura we turned off the highway again and followed the signs to a beach. We were rewarded with a beautiful black sand beach which was lined by pretty Pohutukawa Trees, otherwise known as the New Zealand christmas tree. These magnificent trees when in full bloom are a mass of bright red flowers with glossy green leaves. We continued and walked a short distance on the track. Then it was onto the town of New Plymouth, the main service centre of the Taranaki region. Puke Ariki (Taranaki Museum and Library) is an interesting feature along the waterfront and also houses the Tourist Information Centre as well as an interesting collection of Maori artefacts and displays and a few pioneer exhibits and wildlife specimens. 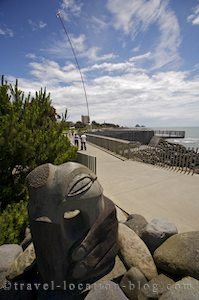 Across the road is the Foreshore Coastal Walkway featuring interesting pieces of art such as the Windwand, various stone sculptures, and a whale bone display called Tutunui's Garden. With the weather turning slightly drab again, we continue our journey around the mountain stopping briefly at the pretty Lake Mangamahoe which on a fine day reflects the towering Mt Taranaki. We checked out the North Egmont Visitor Centre (on the mountain) then drove around to the East Egmont Visitor Centre and decided to enjoy a New Year's eve dinner at the Mountain House - an accommodation and restaurant establishment near the Visitor Centre on the eastern slopes of Mt Taranaki. After dinner we headed back to our new favourite campsite at Cape Egmont Lighthouse to see in the new year! !